I don’t eat “diabetic” foods. I don’t eat anything that says, “made for diabetics” and I hardly ever eat sugar-free foods. If I want something like chocolate or jam I eat a small amount of the real thing. I’m more concerned what chemicals they put in when they take the sugar out. Besides, many foods “made for diabetics” have as much carbohydrate as the real thing. I’ve even managed to reduce my dependence on artificial sweeteners. It’s been a long slog. But now, a little half & half in my coffee or tea makes it mouth-satisfying enough that I don’t want, or even like, the sweetness anymore that a Splenda or Equal gives it. And oatmeal and cottage cheese without sweetening taste just as good, as my sweet-tooth has waned. Extend Snacks. I found Extend Bars, one of the company’s original products, years ago and they’ve been in my house ever since. If when I’m going to sleep, I’ve had enough wine with dinner that I know my blood sugar will drop significantly through the night, I eat one-third of this bar and I wake up fine. (Amount may vary for you). Extend Snacks now include crisps and shakes and all their products work on the same principle: they contain cornstarch which breaks down very slowly and helps maintain level blood sugar for 7 to 9 hours. 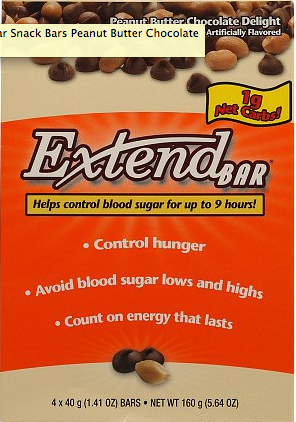 Extend Snacks were created by pediatric endocrinologist Francine Kaufmanafter she noticed cornstarch’s ability to help patients with severe lows. If that sounds a little too medical, the bars taste really good. Peanut Butter Chocolate Delight is the most popular and my favorite. Extend Snacks are available at Walgreens and other chain stores. Or you can order online as I do because they’re not in the NY area, yet. In fact just recently I’ve been part of a letter writing campaign to try and bring them to New York City chain drug store CVS and Walmart. By the way, Extend Snacks hasn’t asked me to write this. I just like to share what works for me in the hopes it may work for you.